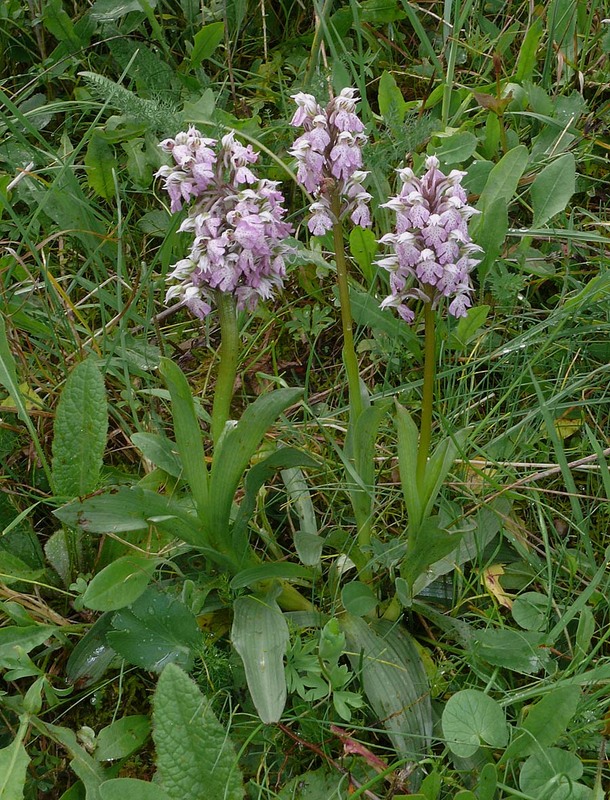 This is a very familiar Mediterranean orchid whose name refers to the milky colour of its flowers. 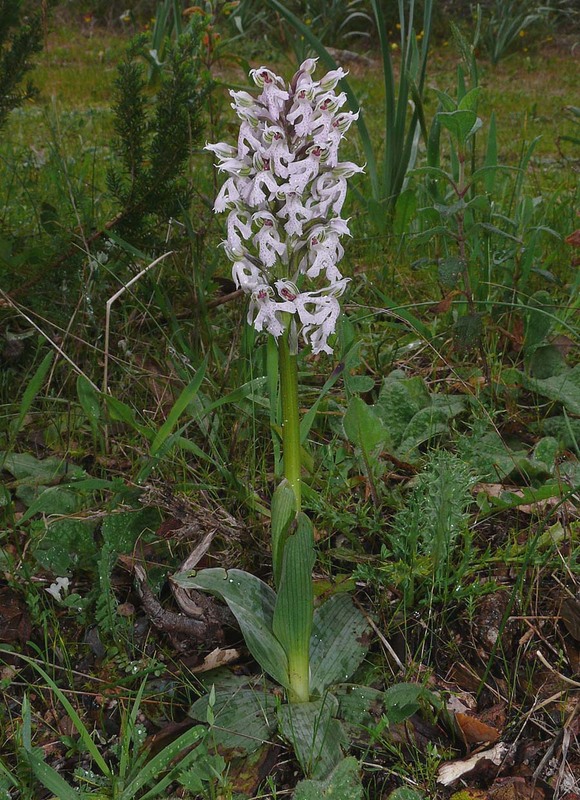 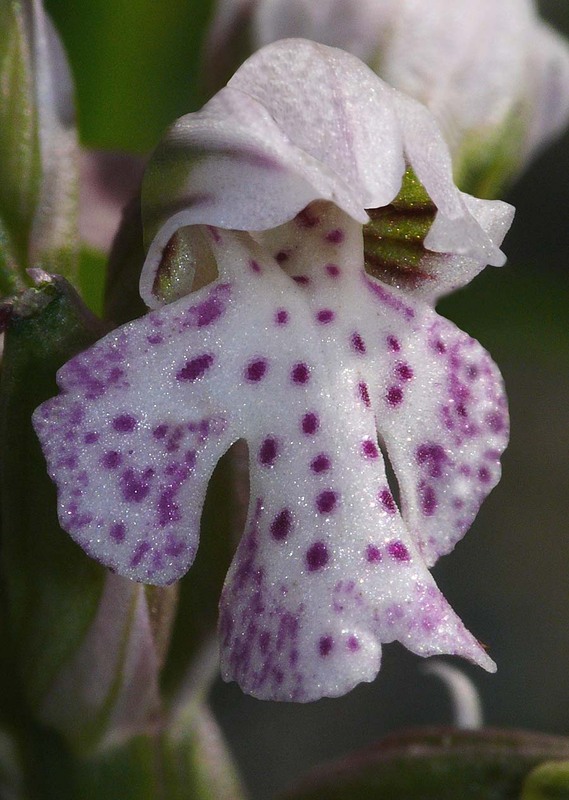 It was first described by Poiret from Algeria in 1798 and originally grouped with the Neotinea genus before then being reclassified as an Orchis. 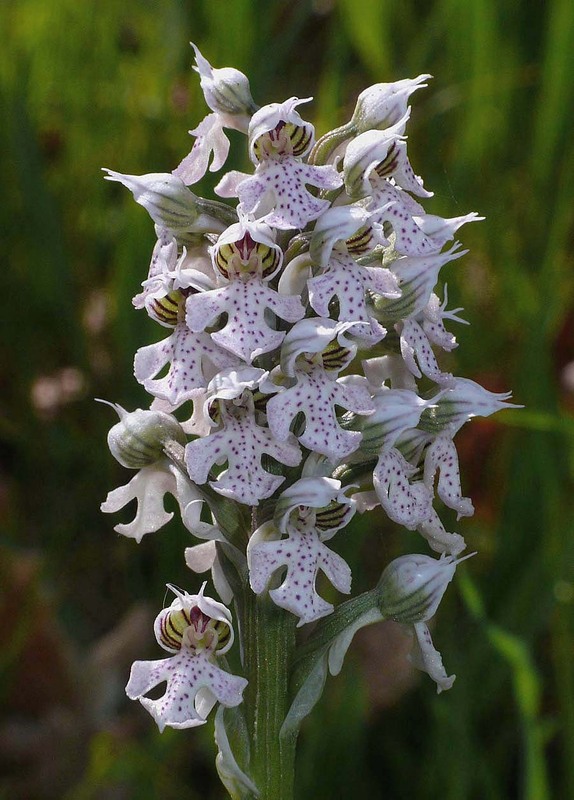 Subsequent studies across the O. tridentata group eventually resulted in all its members, including O. lactea, being returned to the Neotinea stable. 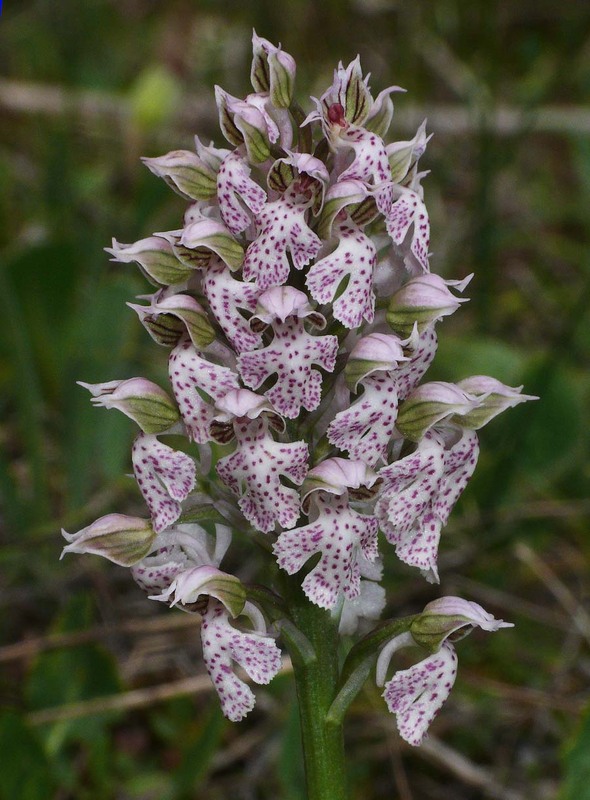 N. lactea is a widespread orchid that ranges throughout the Mediterranean but which is rare in southern France and at its most frequent around the Aegean, its distribution is not however fully understood due to confusion with N. tridentata, N. conica and N. commutata. 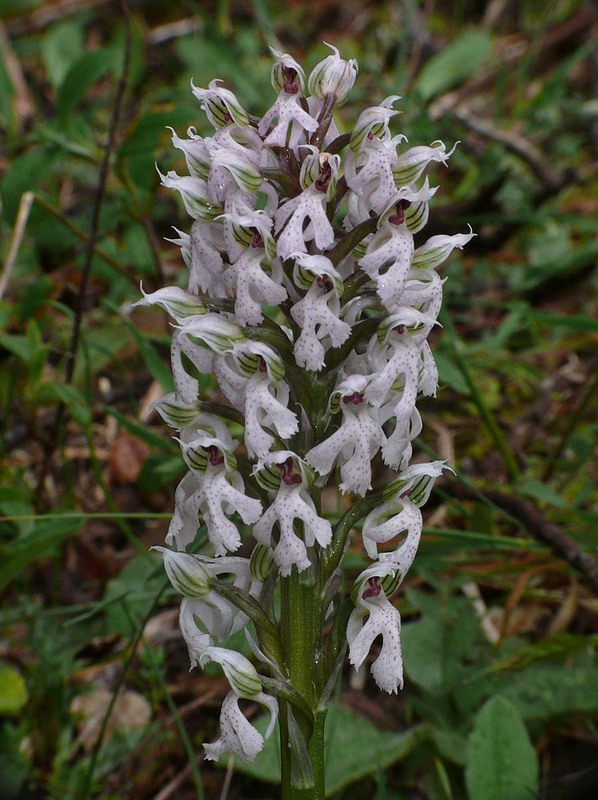 There is currently a movement seeking to separate the N. lactea growing in southern Corsica and proposing its reclassification as the long forgotten Orchis corsica, but whilst these plants are distinctively marked, they do not seem to represent any evolutionary milestone. 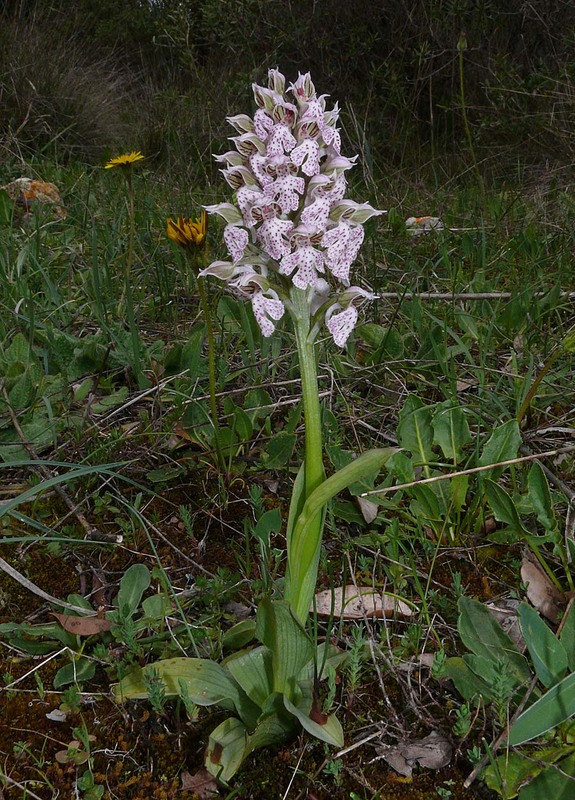 There are two significant features which can help differentiate N. lactea from the other three, firstly it has an elongated inflorescence that usually (but by no means always) carries numerous tightly packed flowers, whereas the latter two species have a conical shaped inflorescence and in the case of N. tridentata the flower head tends to be flat topped with a longer stem. 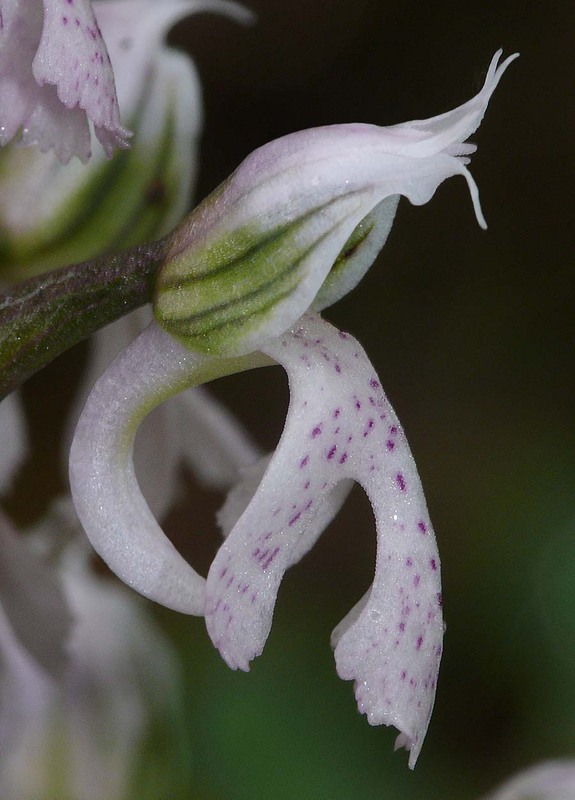 The second distinguishing feature is the lip, which in this species has a geniculated profile and strongly recurved lip margins. 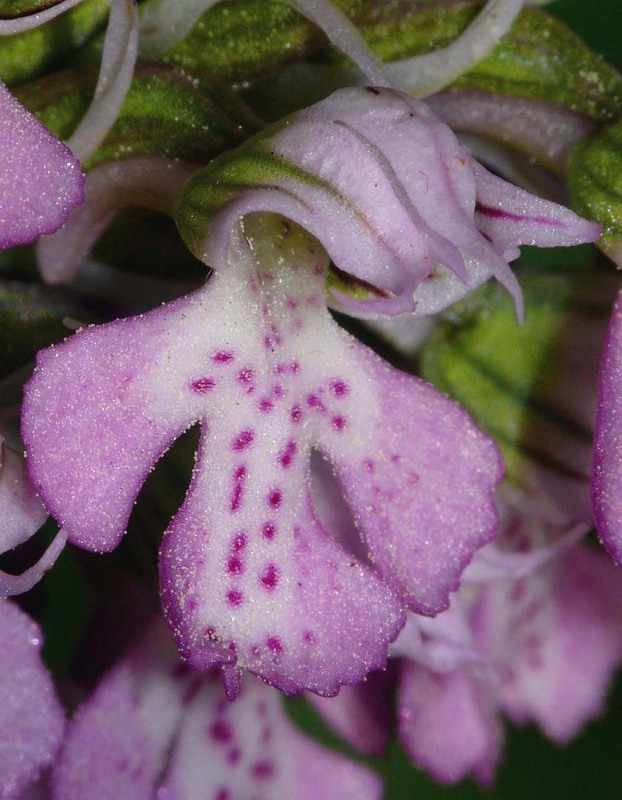 The overall impression is of a body builder throwing his chest forward and shoulders back. 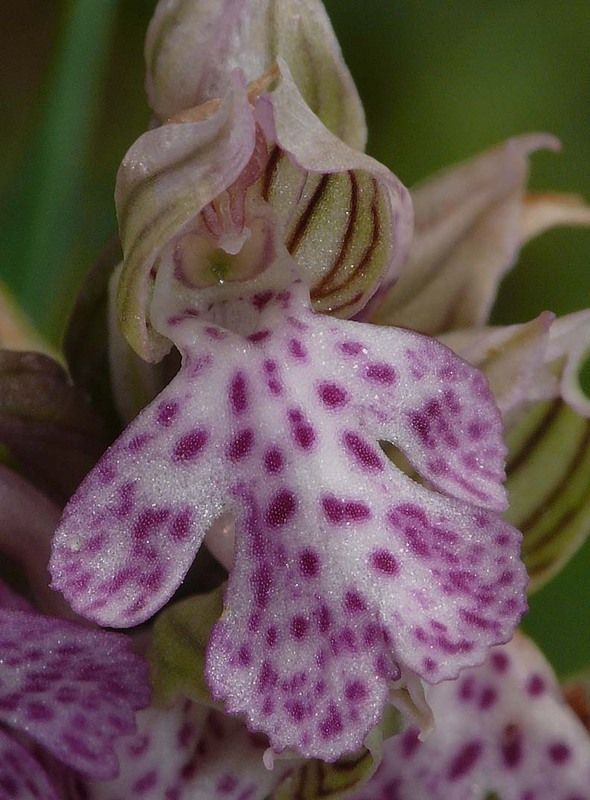 The other species all have flat profiled lips with edges that are either straight or curved forward. 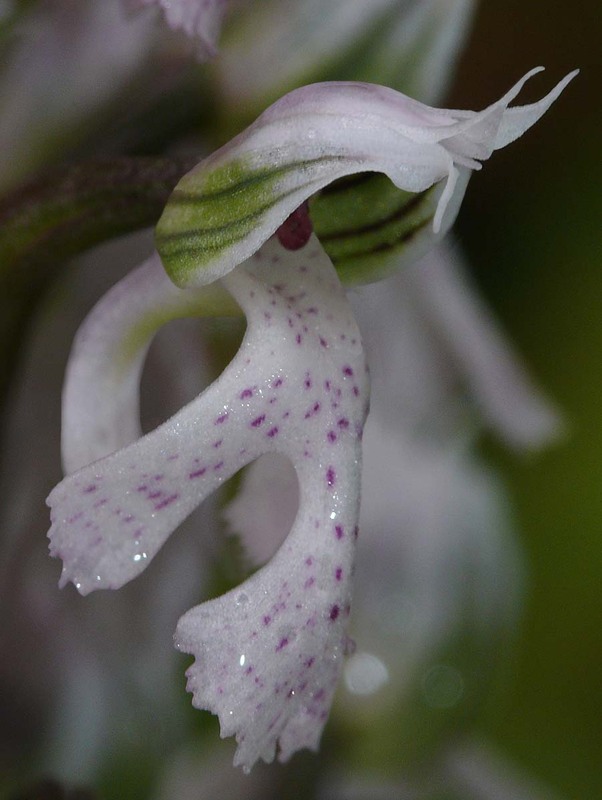 A less reliable feature of N. lactea is the colouration of the inner hood which is generally greener and more boldly lined. 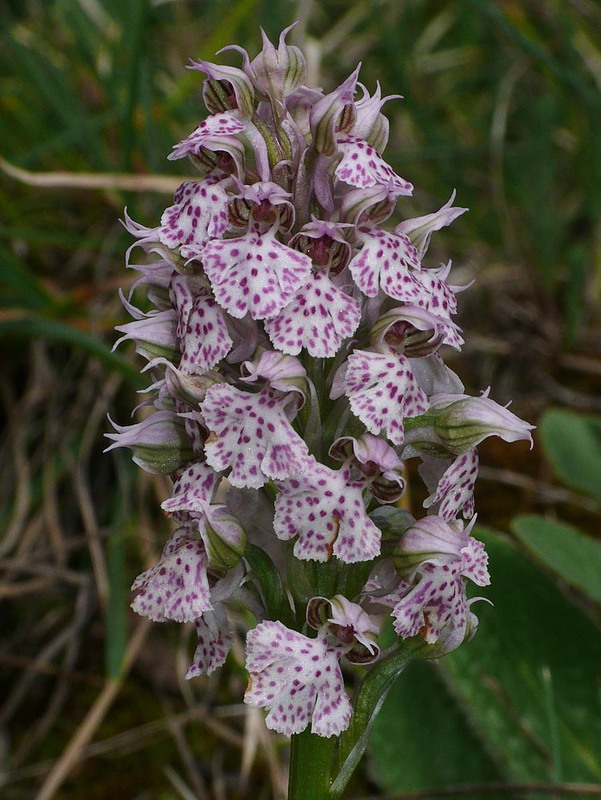 As can be seen from the illustrations, lip markings and colouration can vary widely from pure white to an almost solid dark pink, the typical flower is however pale pink with darker spots or striation. 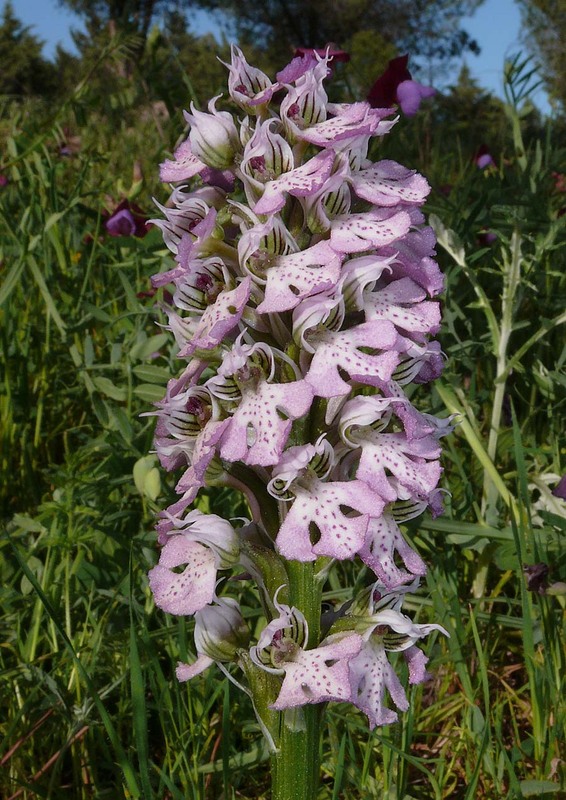 The photographs come from Crete, Sardinia and Sicily and were all taken during the first two weeks of April.